Darkness falls . . . Despair abounds . . . Evil reigns . 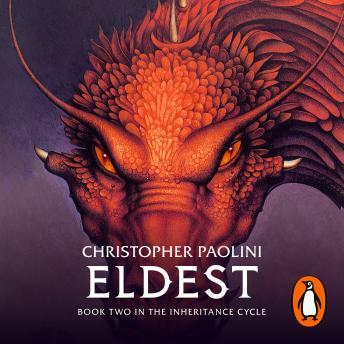 . .
Love these inheritance cycle books. App works great. Never have any issues. Narrator maintains good character voices throughout the story, which aids in maintaining the listeners emotion to the characters. Great story. Absolutely loved this series and the narrator was amazing! I'M SO A FAN!!!!! ?????????? I love the book and it gave me inspiration to me and I have a great piece to my own book and have read this book SO MANY TIMES !!! amazing!! All 4 books take you on an adventure and make you want to learn magic. I'm a 100% disabled veteran and have ptsd from 212 combat missions, these books have been therapy for me. I have the books and the books on tape, when the anxiety or anger hits I put the headphones on and then I'm no longer a vet sitting by myself trying to figure out how to deal with the difficulties of civilian life, I'm flying with Eragon into battle against the empire. I've also given the books as gifts and everyone i have given them to has become addicted to them. they are books for readers of all ages. This is an excellent book and the reader is also excellent. This is a very good story and I am very excited to read the next one. A great book with a great story line. Kept me awake and entertained for hours in the car. I enjoyed every part of it! The narrator is fantastic as well. The characters' "voices" seem very realistic and are consistent through the whole series. A great book. I am lost within the storey for hours at a time.